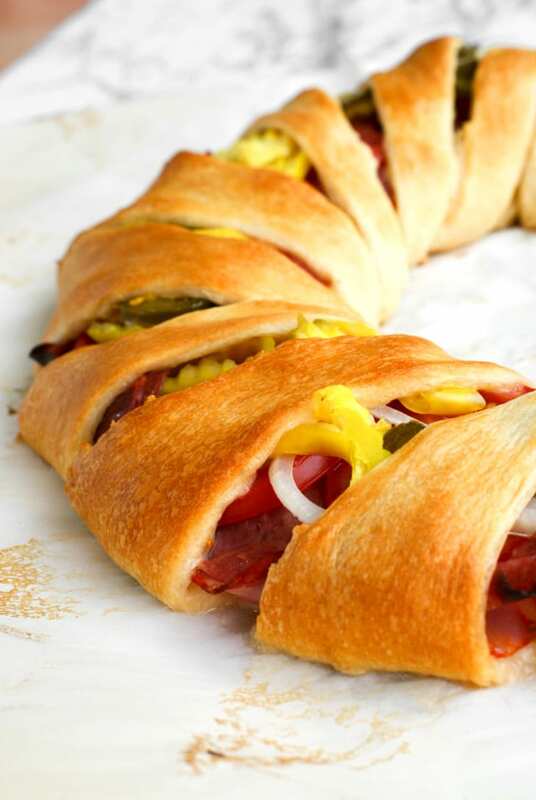 When’s the last time you got yourself a roll of pre-made crescent dough? 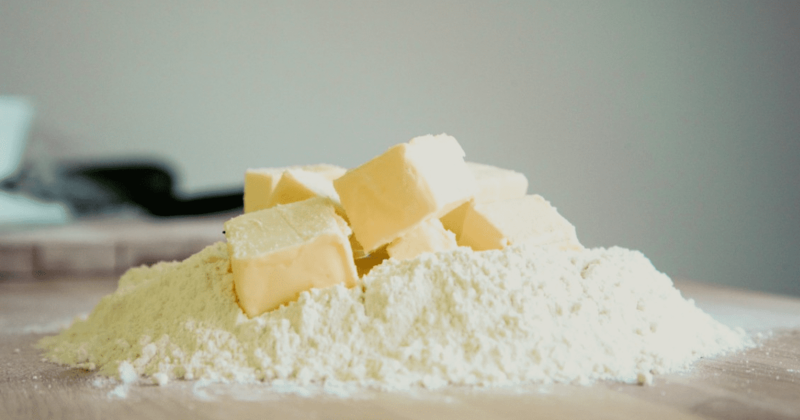 Although the most dedicated bakers among us might try to make everything from scratch all the time, we all have our weaknesses—sometimes a roll of store-bought cookie dough is just easier, for example. Still, most people underestimate just how useful one of these pre-made rolls of crescent dough can really be in the kitchen. If you have this dough lying around the house, there’s really no limit to the number of delicious dishes you can make… but we’re going to put a cap on it for you. 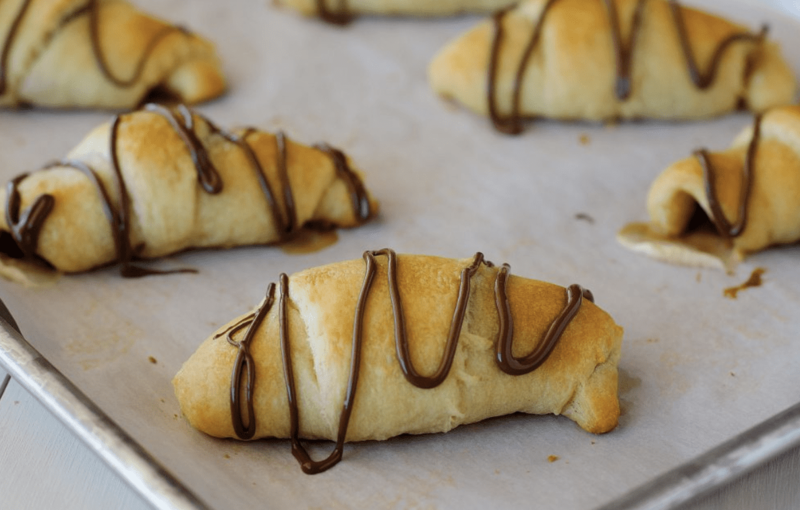 With no further ado, here are 30 of the best crescent dough recipes you can make. Burritos are probably not the first thing that comes to mind when you think crescent dough—but this recipe should definitely change that. To make it, preheat your oven to 350 and cook a pound of ground beef in a skillet, crumbling it up. 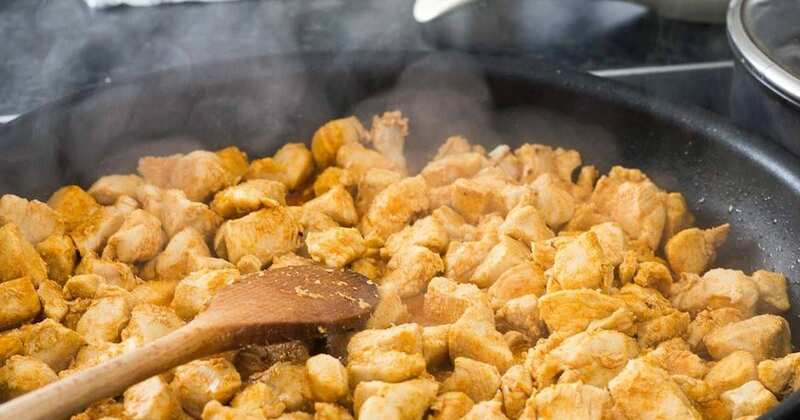 Add a can of refried beans, 1/4 cup of chopped onion and a packet of taco seasoning and stir to combine. Next, unroll your crescent dough into a dish and press it int the bottom and up the sides. Spread the beef mix in the middle, sprinkle it with a bunch of cheese and pop it in the oven. Bake it uncovered for 30 minutes and you’re ready to eat! Get the full recipe here. Sticking with the TexMex theme, this beef nacho pie is another delicious option. Just like the other recipe, cook a pound of beef and 1/2 a cup of chopped onion over medium heat until all the pink is out of it. Stir in a can of tomato sauce and a packet of taco seasoning and bring everything up to a boil. After that, turn it down and let it summer for five minutes, uncovered. Next, open your crescent dough into eight triangles and pet them in a greased pie plate, points toward the center. Press the pieces into the bottom and up the sides, sealing them together. After that, sprinkle one cup of of crushed nacho cheese Doritos onto the crust and top that with your meat mix. 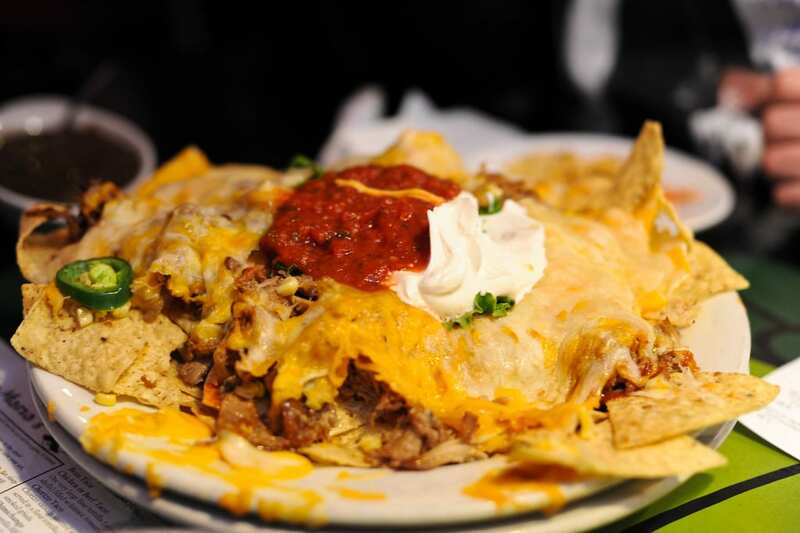 Spread a cup of sour cream on top of that and add a bunch of cheese and more chips on top. When it’s ready, bake for 20-25 minutes at 350 degrees. Let it sit for about five minutes before you dig in. Get the recipe here. 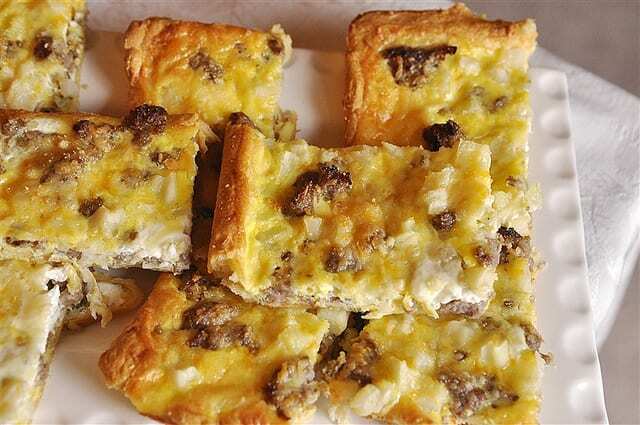 If you want more of a bite-sized, breakfast-themed recipe to make with the dough, this is the one for you! Start by cooking 1/2 a pound of hot sausage and two tablespoons of minced onion in a skillet. Cook out all the pink, for about four to five minutes, and stir in two tablespoons of minced chives. Next, unroll your crescent dough on a floured surface into a rectangle. Seal up all the edges and cut into 48 even pieces. After that, get out some greased muffin tins and press the pieces into each of the holes. When the sausage mix is ready, fill each muffin tin with roughly two teaspoons of the sausage mix. After that, mix four beaten eggs, two cups of shredded Swiss cheese, one cup of cottage cheese and 1/3 up of grated Parmesan into a bowl. Combine it and spoon two teaspoons of it into each muffin tin as well. Finally, sprinkle each one with some paprika and bake at 375 degrees for 20 to 25 minutes. Let them cool for five minutes and enjoy! Get the full recipe here. 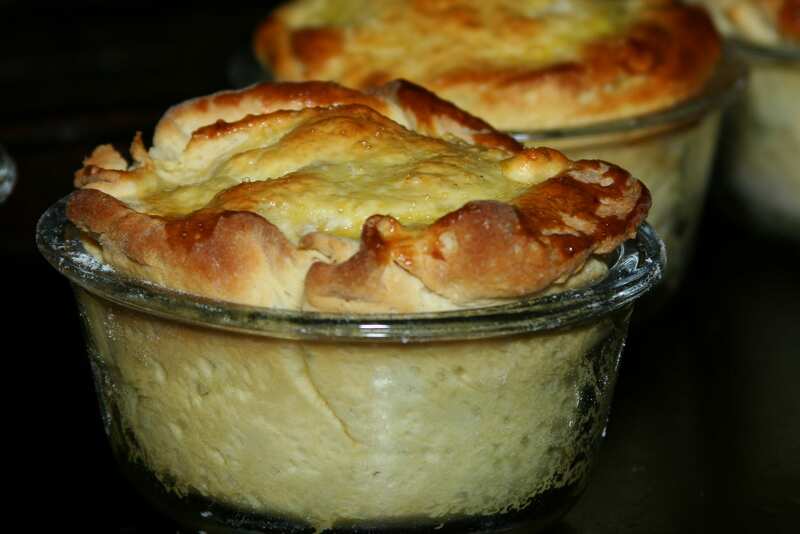 In a similar vein are these chicken pot pie cups, each one perfectly bite-sized. Start by preheating your oven to 375 and greasing up a muffin tin. Next, melt two tablespoons of butter in a skillet and add two diced carrots, two diced celery stalks, 1/2 a chopped onion and two teaspoons of fresh thyme. Season with salt and pepper and cook everything for about three minutes. /Next, stir in two tablespoons of flour and cook for another minute. Add 2/3 cup of chicken broth and 1/2 cup of heavy cream as well, bringing everything to a boil before reducing heat and simmering for five minutes. When everything has thickened, stir in two cups of diced chicken, 1/2 cup of frozen corn and 1/2 cup of frozen peas. Simmer everything until it’s warmed through and set it aside. Next, roll out your crescent dough, pinch it together and cut it into 12 squares. Put the dough in the muffin tin holes and spoon your chicken mix into each one. When you’re ready, bake the tray for 15 minutes until they turn golden brown! Get the full recipe here. 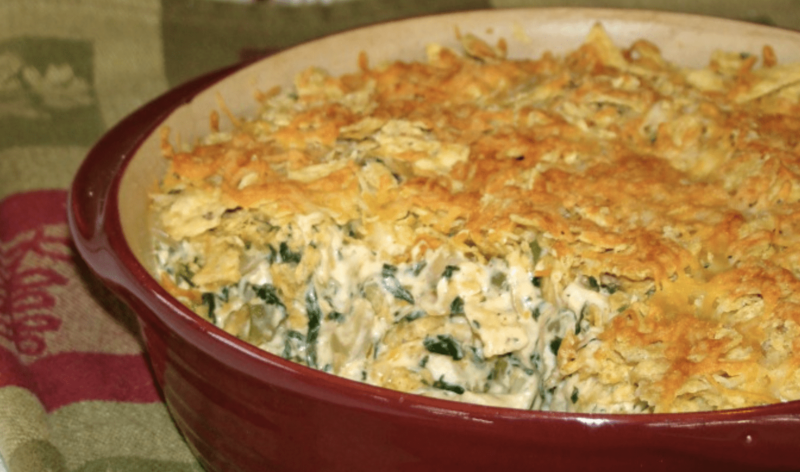 Why bother making separate artichoke dip and chips when you could just bake them together? Do this by preheating your oven to 375 and spraying down a muffin tin. Roll out your crescent dough, pinch it together and cut it into eight squares. 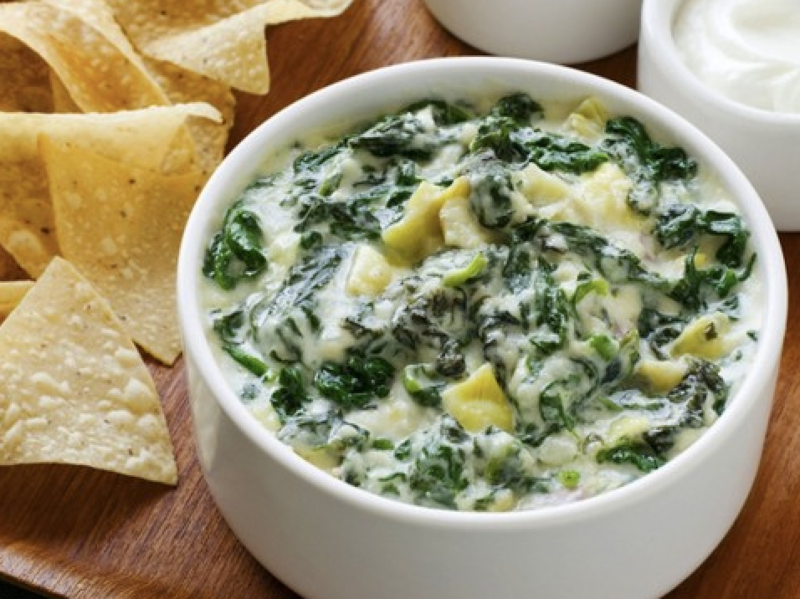 Press the dough into each cup before getting out a bowl and mixing together six ounces of softened cream cheese, 1/4 cup of sour cream, a cup of drained artichoke hearts, a box of thawed spinach, half a teaspoon of minced garlic, 1/2 cup of mozzarella cheese and some salt and pepper. 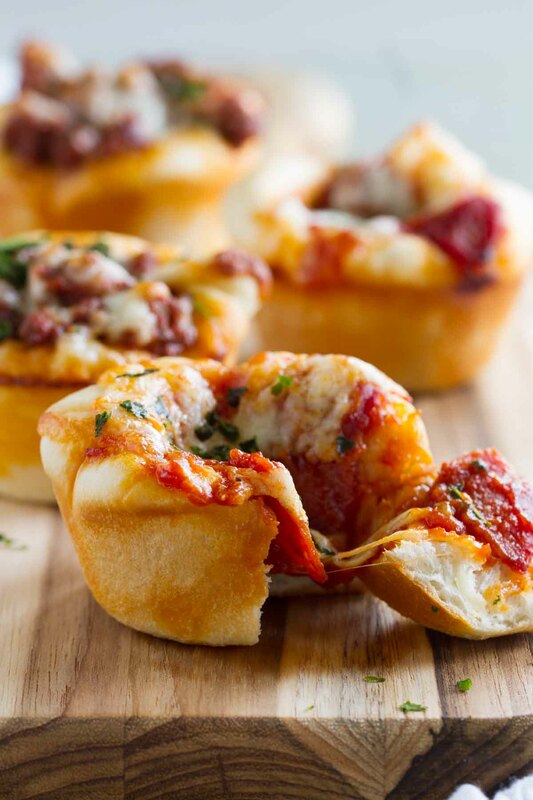 Mix it up and spoon the filling into each muffin tin, topping each with some extra cheese. Finally, bake the whole thing for 10 to 12 minutes or until the cups turn golden brown! Get the full recipe here. 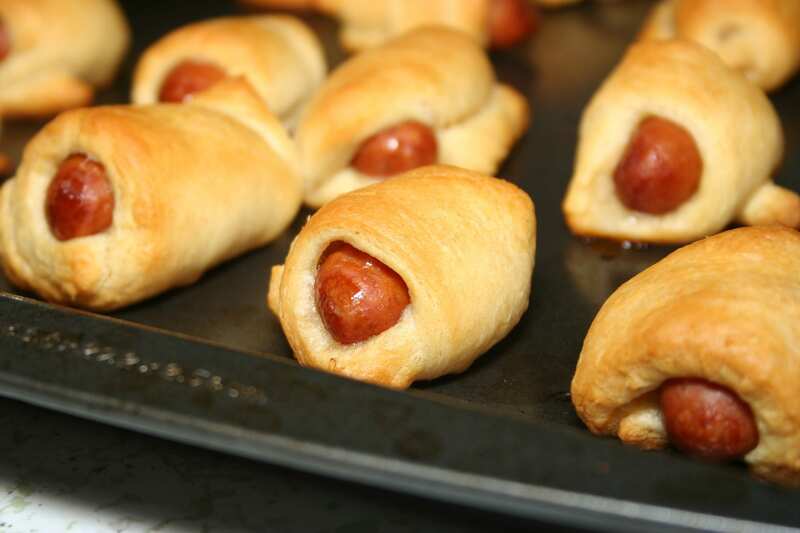 If you’ve got a party coming up and you want to keep things simple, pigs in a blanket is always a great way to go. Preheat your oven to 375 and roll out your crescent dough. Tear it according to the perforations and tear each triangle into three smaller ones. Next, put a cocktail wiener on the point of each mini-triangle and roll each one up. Move them over to a baking sheet and brush each one with melted butter before gently salting each one. Finally, bake the sheet for 12 to 15 minutes and you’re good to go! Get the full recipe here. If you like a hearty breakfast but never have time to make one, this is the recipe for you. Preheat your oven to 375 and grease up a baking sheet. Next, whisk together 12 eggs and 1/4 cup of milk or half-and-half. After that, melt butter in a nonstick pan until it gets foamy and add your egg mix. Cook with a spatula until the eggs are just set before seasoning with salt and pepper. Take it off the heat and unroll a can of crescent dough onto the baking sheet, pinching the same together. Add a layer of sliced deli ham before topping with the egg mix as well as chopped chives and shredded cheese. 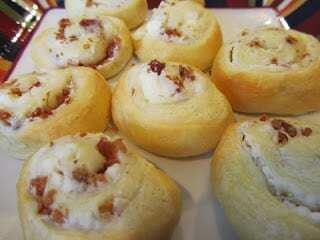 Unroll a second can of dough and carefully put that on top of the sheet, again pinching it to seal. Next, brush the top of the dough with melted butter and sprinkle it with poppy seeds, sesame seeds, minced onion, dried garlic and sea salt to your liking. When you’re ready, bake the whole thing for 25 to 30 minutes. Let it cool for 15 minutes before chopping it into squares! Read the full recipe here. With Thanksgiving coming up quickly, this recipe could be especially useful. Begin by preheating your oven to 375. Next, mix half a cup of mayonnaise, two tablespoons of flour, a teaspoon of chicken bouillon and a pinch of pepper together. Gradually stir in 3/4 cup of milk as well and bring it to a boil over medium heat, cooking and stirring it for two minutes until it turns thick. Add two cups of frozen mixed vegetables along with one and a half cups of chopped, cooked turkey. Cook the whole thing and stir it until it’s heated through. Transfer everything to a greased up baking pan. Next, unroll your crescent dough and break it into eight triangles. Arrange it over the turkey mix and bake it for 15 to 20 minutes until it’s heated through and the top is golden brown. Read the full recipe here. 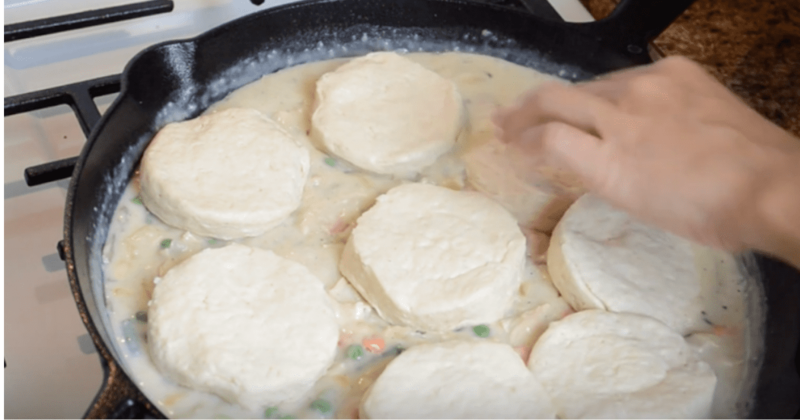 If you’ve never had these delicious chicken puffs before, you’re in for a treat. To make them, get out a small bowl and beat together four ounces of soft cream cheese and half a teaspoon of garlic powder. Stir in half a cup of cooked, shredded chicken as well. Next, unroll your crescent dough and break it into 16 triangles. After that, cut each triangle in half lengthwise. Scoop one teaspoon of your mix into the middle of each one before sealing each triangle. When you’re done, put all the puffs on a greased up baking sheet one inch apart. Bake everything at 375 for 12 to 14 minutes until it turns golden brown. Read the full recipe here. If we didn’t mention it yet, you can obviously use these dough ingredients to make amazing desserts as well—and these cherry turnovers are just the ticket. Start by preheating your oven to 375 degrees before unrolling your dough and breaking it into four rectangles. Put them all on a baking sheet before pinching them together to seal. Add a quarter cup of cherry pie filling on half of each rectangle before folding the dough over the filling and pinching it shut. Bake everything for 10 to 12 minutes. At the end, make frosting by mixing half a cup of confectioner’s sugar with one to two tablespoons of milk in a bowl. 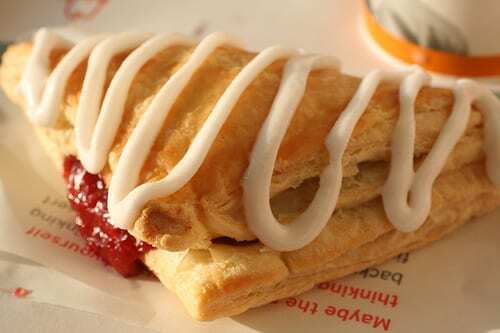 Drizzle it over your turnovers and serve! Get the recipe here. If you want all the flavor of a homemade pizza without as much of the work, this is a good option. Start by opening up two tubes of crescent dough and breaking one into eight rolls each. 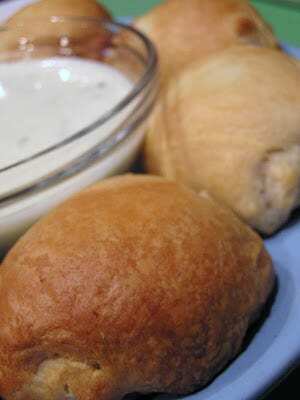 Cut the rolls in half and press those chunks into the bottom of a greased muffin tin, pressing the dough up the sides. Next, spoon some pizza sauce into each cup before sprinkling in some chopped onion, green pepper, pepperoni and shredded mozzarella cheese. When they’re all ready, bake them at 375 for 15 to 18 minutes and enjoy! Read the full recipe here. We haven’t even gotten into any pinwheels yet—and this one is a real winner. Start off by preheating your oven to 375 degrees and mixing together three ounces of cream cheese, two tablespoons of chopped onion and a teaspoon of milk until they’re blended. On a floured surface, roll out your crescent dough into a rectangle and pinch it to seal. Spread it with your cream cheese mixture and sprinkle it with cooked, crumbled bacon (about five strips’ worth). When you’re ready, roll the rectangle up like a jelly roll and pinch it to seal. Use a serrated knife to cut the roll lengthwise into 24 half-inch slices. Put each one on an ungreased baking sheet with the cut side down. Finally, bake the tray for 12 to 15 minutes until it turns golden brown and you’re ready to eat! Get the recipe here. 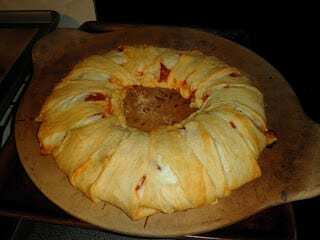 If you need more of a presentable, pizza-themed appetizer, this tasty pizza ring dish should do the trick. Start by cooking a pound of sausage in a big skillet over medium heat until it’s cooked through. Drain the fat out and stir in a half cup of pizza sauce, a cup of shredded mozzarella cheese and four ounces of chopped Canadian bacon. Unroll your crescent dough and break it into triangles. Get out an ungreased pizza pan and lay your triangles in it with the points facing the outside and the wide parts overlapping in the middle. Next, spoon your filling into the wide ends of the triangles and fold the points of the triangles inward over the filling to form a ring. When you’re ready, bake the whole thing at 375 degrees for 12 to 15 minutes until it’s golden brown. 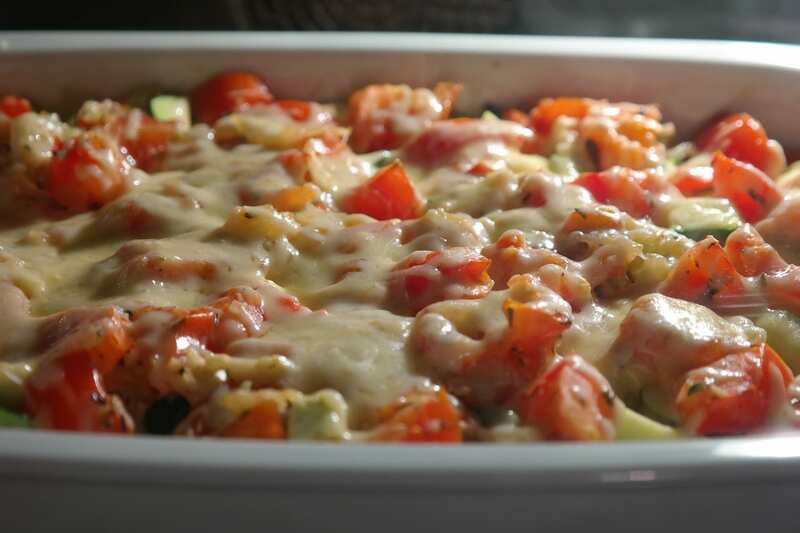 Sprinkle the top of it with more cheese and bake for another five minutes before serving it with pizza sauce! Check the full recipe here. So far, we haven’t even been showing many recipes that actually make individual crescents. 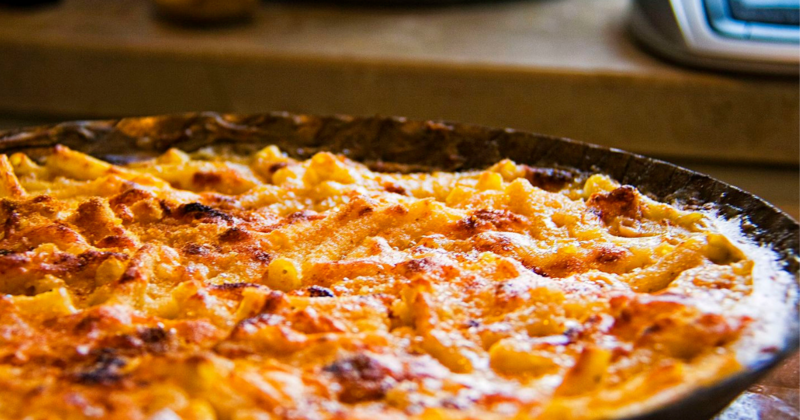 Still, we’ll make an exception for this delicious dish. 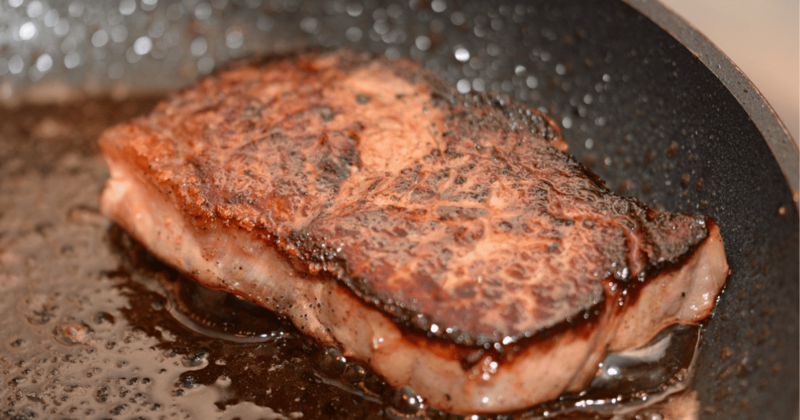 Preheat your oven to 375 degrees before melting two tablespoons of butter in a skillet on medium high heat. Add a cup of sliced portobello mushrooms and half a sliced onion, cooking for two to three minutes until softened. Turn the heat down to medium low, cooking for 10 to 12 minutes while stirring until the onions turn golden. Add your three minced garlic cloves and cook for another minute before taking everything off the heat. Add a third cup of Parmesan and a tablespoon of parsley before stirring again. Next, unroll your crescent dough and break it into triangles. In each one, scoop a tablespoon of the mushroom mixture at the wide end of the triangle before topping it with a tablespoon of mozzarella cheese and rolling it up. Put each crescent two inches apart on a baking sheet with the point side down and twist the ends slightly. Brush each one with melted butter and bake everything for 10 to 12 minutes! Check out the full recipe here. Are you a fan of Indian food? If so, these crescent samosas are sure to be one of your new favorite dishes. Start by preheating your oven to 375 and mixing up 3/4 cup of reduced-fat plain yogurt, two tablespoons of minced cilantro, one clove of minced garlic and half a teaspoon of ground cumin. Throw that into the fridge and begin heating oil and sautéing a can of diced, drained potatoes until browned. Add a quarter cup of green chilies, a clove of minced garlic, a teaspoon of curry powder and a dash of pepper. Cook for a minute while stirring and transfer to a bowl. Add one and a half teaspoons of lemon juice and mash everything up before stirring in a cup of thawed peas. Next, unroll the dough and break it into 16 triangles. Scoop a tablespoon of the mix into the wide end of each one, rolling up from the wide end. Put them two inches apart on baking sheets with the point side down, curving them to make crescents. Bake them for 10 to 12 minutes until they turn golden brown; serve them with sauce. Get the full recipe here. In line with some of the other snack-size dishes on this list, these parmesan mushroom mini-bites are a great option. Start by preheating your oven to 375 degrees. In a big skillet, melt butter over medium high and add in a chopped green onion and a half pound of chopped mushrooms. Stir until tender and add a clove of minced garlic, cooking for another minute. Add half a cup of heavy cream and half a cup of grated Parmesan, cooking and stirring everything for three to four minutes until everything evaporates. Next, unroll your crescent dough into a rectangle and cut it into 24 pieces. Press it the cups in a muffin tin and fill each one with one and a half teaspoons of mushroom mix. 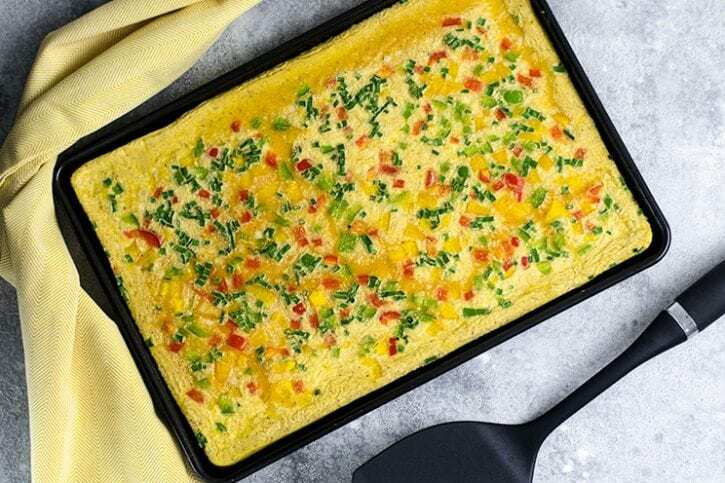 When it’s ready, bake it for eight to 10 minutes or until it’s golden brown and top with green onion! Get the full recipe here. Although we’ve covered a bunch of appetizers so far, anyone looking for an Asian-inspired dish should try this one out. 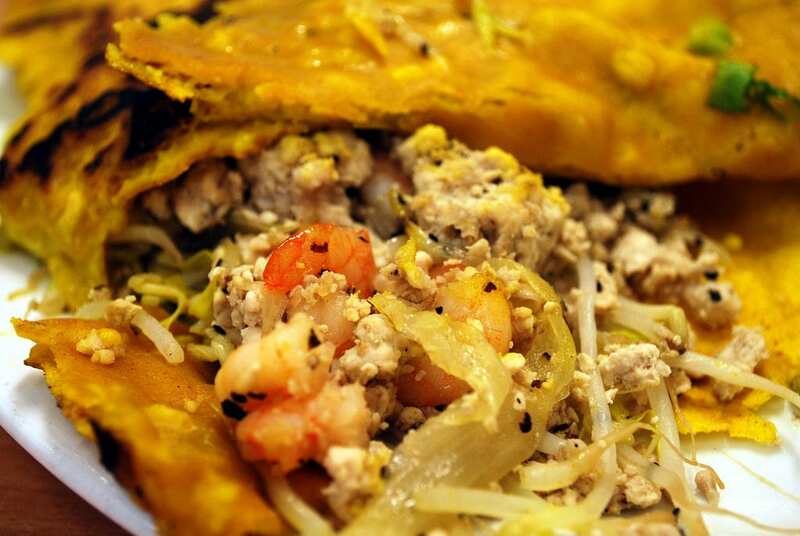 Begin by blending half a pound of ground pork, half a pound of uncooked shrimp, 1/4 cup of soy sauce, two tablespoons of oyster sauce, two tablespoons of sesame oil, three cloves of minced garlic and a tablespoon of ginger in a food processor. Pulse until it’s all finely chopped before unrolling your crescent dough and spreading the pork mix all over it, leaving an inch border all around. Roll the dough up like a jelly roll and pinch it shut, freezing it for an hour. After that, chop it crosswise into half inch pieces and fry the slices in oil for two to three minutes at a time in a skillet. Drain them on paper towels before baking the pieces in the oven at 375 for 12 to 15 minutes. When it’s done, put them on wire racks to cool and mix together chili sauce, soy sauce and sesame oil to serve with! Get the full recipe here. Here’s another dessert option that comes crescent-shaped and tastes oh-so-good. Start by preheating your oven to 375 degrees before unrolling your crescent dough and breaking it into eight triangles. Scoop a teaspoon of Nutella on the wide side of each one before sprinkling with graham crackers, chocolate chips and marshmallows. Roll each one up and put them all on an ungreased baking sheet with the point-side facing down. Shape them into crescents and bake for nine to 11 minutes. Get the full recipe here. These delicious, snack-size desserts are our favorite and they’re so easy to make. Preheat your oven to 350 and lay a sheet of parchment paper down on a baking tray. Unroll your crescent dough and separate it into triangles. 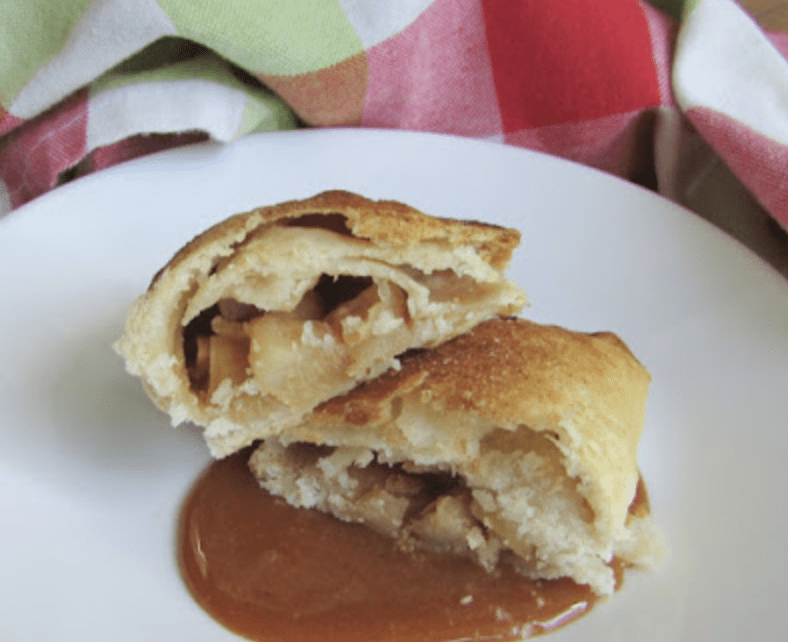 Next, put an apple slice on the wide side of the triangle along with a piece of caramel candy on top of the slice. Roll the crescent up, keeping everything together and inside. Put your crescents on the baking tray and brush each one with melted butter, sprinkling sugar and cinnamon on top at the end. Finally, bake everything for 18 to 20 minutes until golden brown and you’re ready to eat! 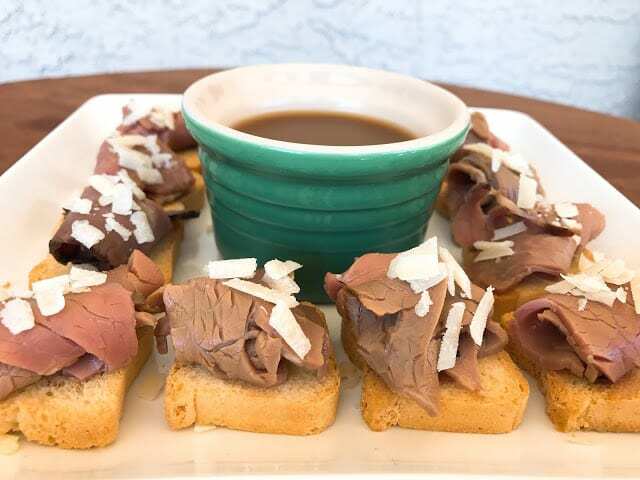 We bet you didn’t think you could turn French dip sandwiches into a roll-up snack—but actually, you can! 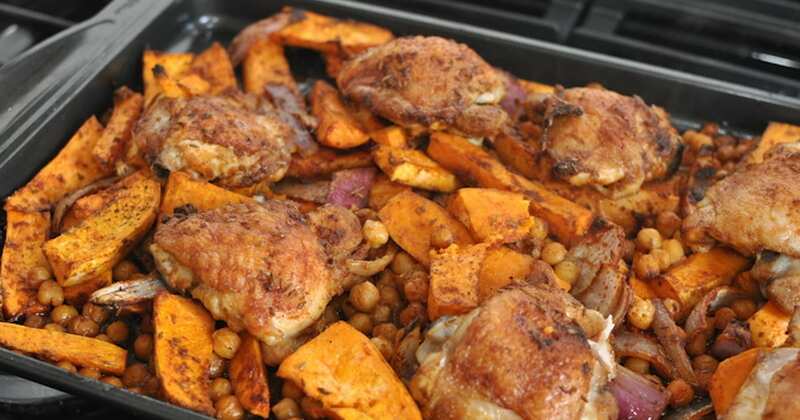 Start by preheating your oven to 350 and greasing up a baking pan with cooking spray. Get out a large skillet and melt butter in it, adding two thinly sliced onions and two teaspoons of thyme sprigs. Cook it all for about five minutes until the onions soften and season it with salt and pepper. Turn the heat down to medium and cook for 10 to 15 minutes, until the onions caramelize. Next, unroll your dough and break it into two rectangles. Pinch the seams together and top each one with slices of provolone, some roast beef and your onions. Roll each rectangle up starting with the short side and pinch to seal, cutting each one into four slices. Sprinkle with thyme and bake for 35 minutes! Make some au jus by melting butter and adding garlic, beef broth, Worcestershire sauce and thyme. Season with salt and pepper and reduce for 10 minutes. Get the entire recipe here. If you wanted the perfect, fruity dessert dish, this is the recipe for you. Begin by preheating your oven to 375 and spraying down a baking dish. Next, mix together cream cheese, lemon juice, lemon zest, sugar, eggs, sour cream, vanilla and kosher salt. Mix everything together until it turns smooth. After that, press a roll of your crescent dough down into the baking dish, covering the bottom and going up the edges (pinch the perforations shut as well). 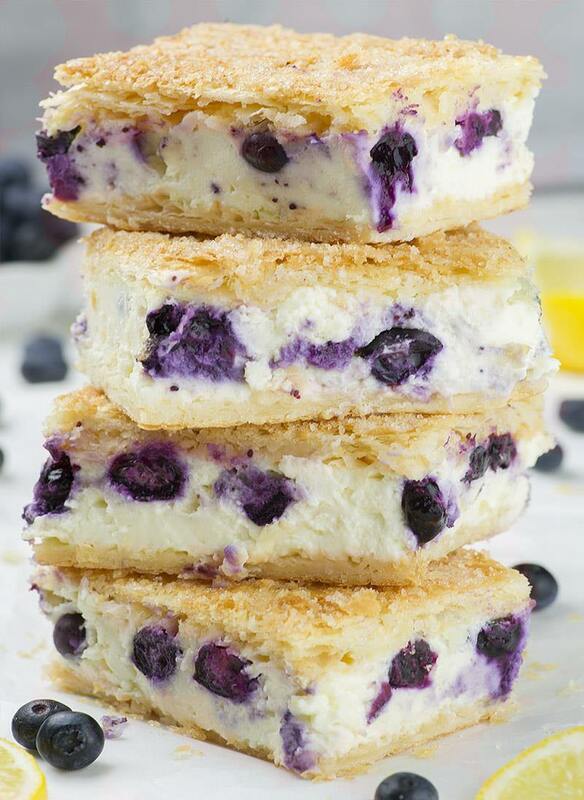 Spread your mix over the dough in an even layer before adding blueberries on top. Top that with another layer of crescent dough and bake for 30 to 35 minutes before cooling it and cutting it into squares. Check out the full recipe here. Sometimes, it pays to keep things simple and savory—just like this tasty appetizer. Start by preheating your oven to 375 and lining a baking sheet with parchment paper. Next, mix melted butter with Italian seasoning, garlic, parsley and basil in a bowl. 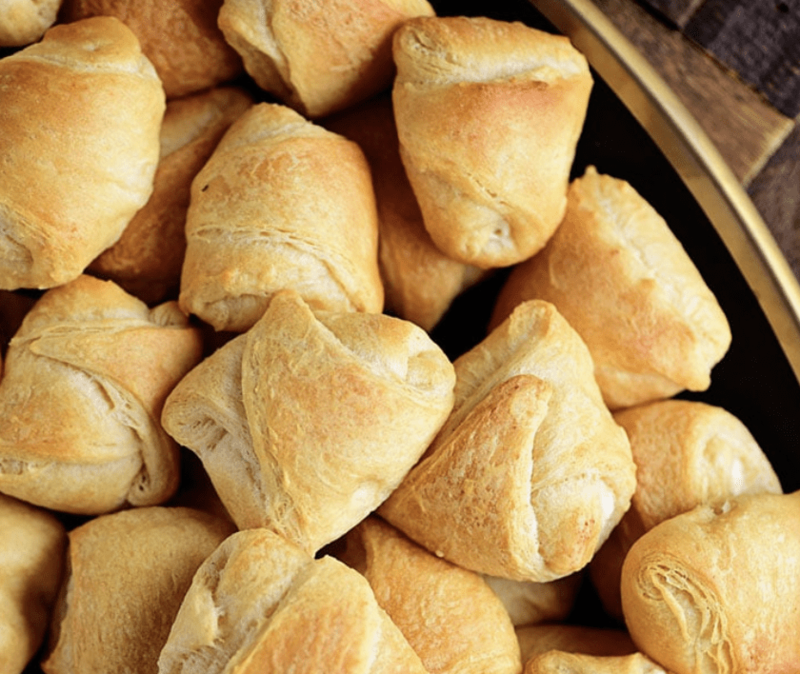 Roll out your crescent rolls and break them into triangles. Brush each one with your garlic butter before putting half of a mozzarella string cheese tube in each one and rolling it up. 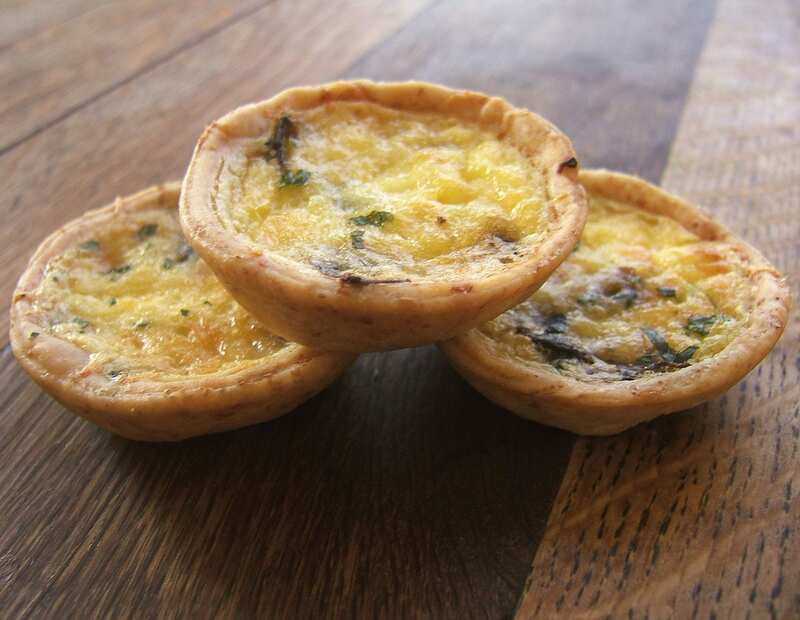 Brush the tops of each one again with garlic butter and bake for 10 to 12 minutes. Get the full recipe here. Love giant subs? 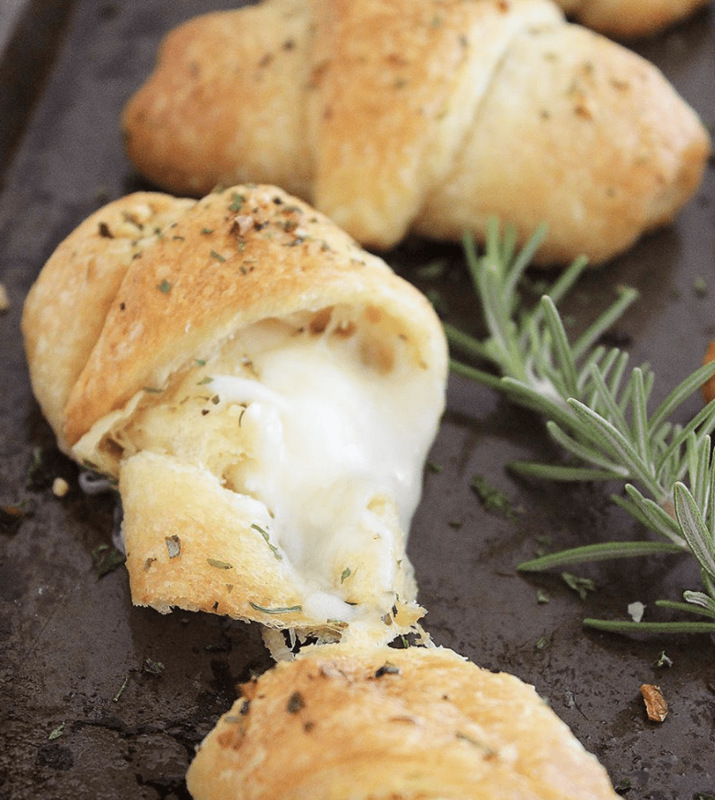 Love crescent rolls? This just might be the dish for you. Preheat your oven to 375 and line a sheet with parchment paper. Break your crescent dough into 16 triangles and place it in a circular pattern with the edges overlapping, point side facing out. Pinch it together somewhat before layering in provolone cheese, ham, capicola, salami, tomato, onion and banana peppers. Season with salt, pepper and dried oregano before rolling the dough triangles up and tucking the dough to make a ring. When you’re ready, bake it for 20 minutes and you’re ready to eat! Get the full recipe here. This one is a little less common and tastes creamy and delicious. 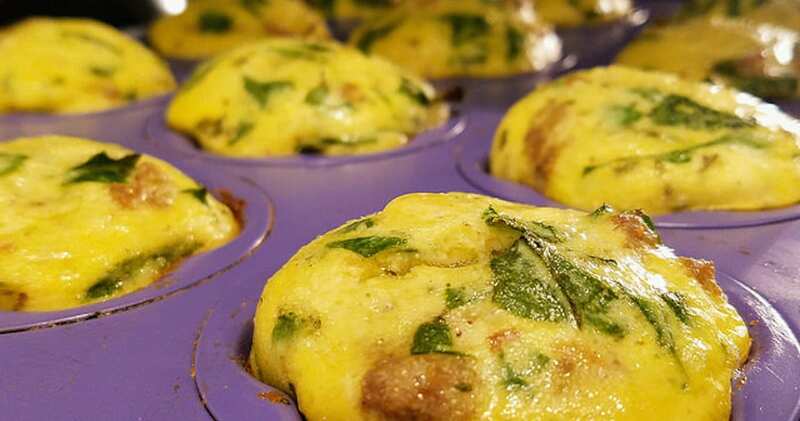 Preheat your oven to 375 and spray down a muffin tin with nonstick spray. Next, whisk together mustard, dill, mayo and garlic powder. Do the same with some canned chicken, cherries, pecans and yellow onions. Combine the mustard and chicken mixes before seasoning it with salt and pepper and popping it all in the fridge. Next, get out a block of cheese and cut it into 24 even cubes. Unroll your crescent dough and make four rectangles out of it, cutting each rectangle into six squares. 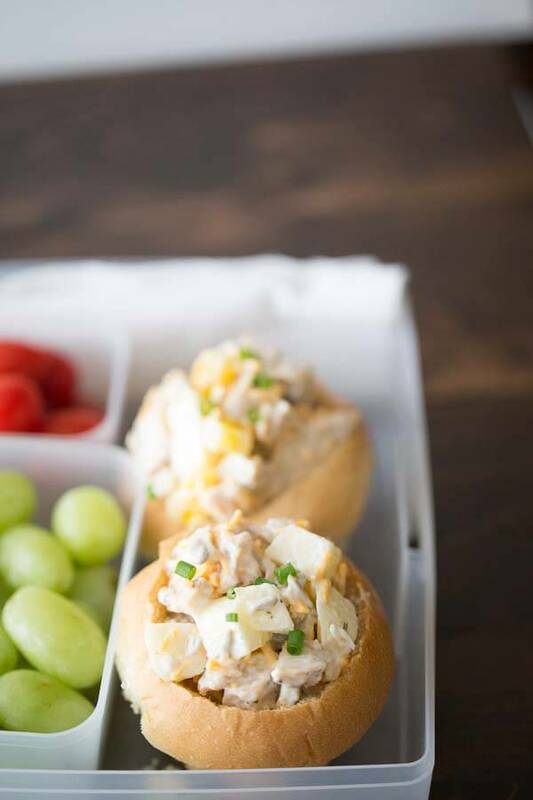 Press these into the muffin tin and fill each cup with chicken salad, topping it with a cheese cube. When that’s done, bake for 12 minutes and enjoy! Get the whole recipe here. Ever been to a fancy restaurant and wonder how they get their rolls so good? This is a good approximation! Start by preheating your oven to 350. Unroll a tube of crescent dough and press the seams together. 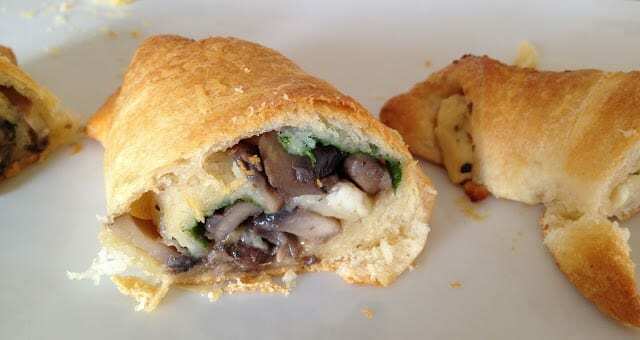 Sprinkle some parmesan and rosemary on top before rolling up the dough lengthwise and chopping it into one-inch chunks. 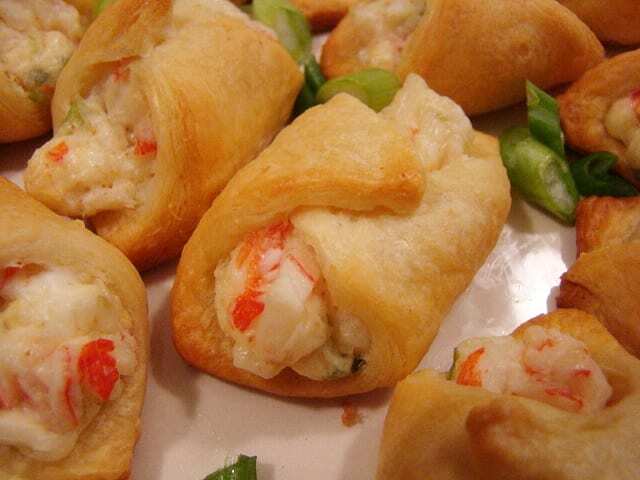 Do the same thing again with another roll of crescent dough and filling. 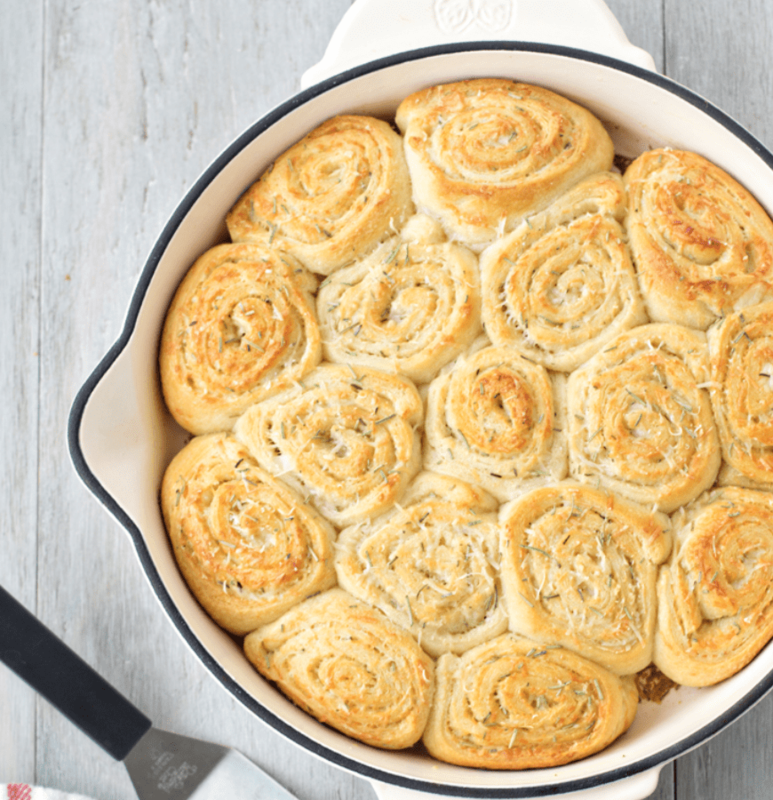 Brush an oven-safe skillet with melted butter up the sides and all along the bottom, as well as on the top of your rolls. 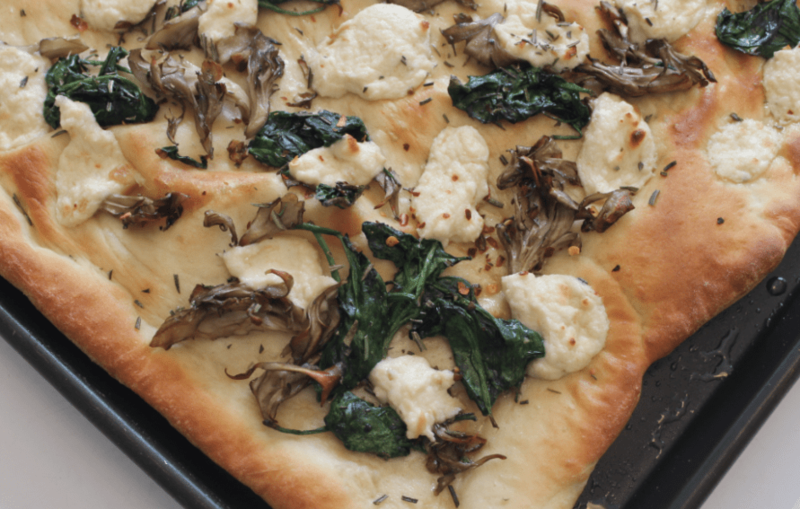 Put your dough slices snugly in the skillet and add extra cheese and rosemary on top, along with some salt. Finally, bake it all for 10 to 12 minutes and serve right out of the pan. Get the full recipe here. This one may be a little unusual as well but the results are so delicious. Begin by preheating your oven to 350. After that, roll out your crescent dough onto a baking sheet and seal the edges. Prick the dough with a fork throughout and bake it for five minutes. 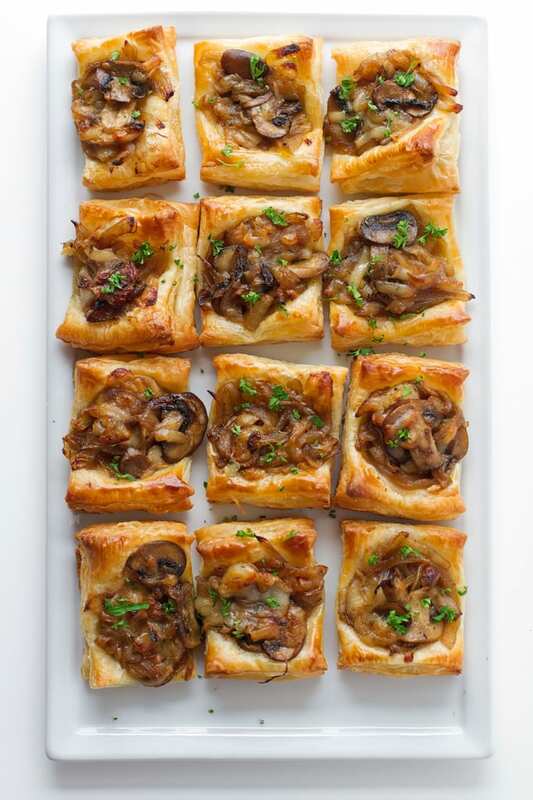 While it bakes, mix together some chopped mushrooms with melted butter and arrange them all around the crust when it’s done. Sprinkle the top with cheese and seasoning and bake the whole thing for 12 to 14 minutes! Get the full recipe here. You can even introduce a little bit of seafood flavor if you so choose. Begin by preheating your oven to 375 degrees and mixing together cream cheese, mayo and mustard together in a large bowl. Add in cheese, carrots, celery, green onions and garlic as well before gently folding in shredded crab. Unroll your crescent dough into a rectangle and cut it into 20 two-and-a-half inch squares. When you’re ready, spoon a teaspoon of the cream cheese mix into each square and fold the dough together into a triangle, pinching it shut. Lay the triangles out on a baking sheet and cook for eight to 10 minutes. Get the entire recipe here. Cherry desserts taste so good and this one is no exception. Begin by preheating your oven to 350 and beating together cream cheese and confectioner’s sugar. Unroll two tubes of crescent roll dough and break into 16 triangles. Scoop a tablespoon of the cream cheese mix into each one and top it with a teaspoon of cherry pie filling. Fold the dough together to make a triangle and seal it up. Next, transfer all the dumplings over to a baking dish before pouring a sugar and melted butter mixture over them. Pour some fizzy cherry flavored soda into the baking container and bake it for 35 to 40 minutes. Get your entire recipe right here. The combination of flavors in this recipe really makes it something special. Start by preheating your oven to 375 and melting butter over medium heat. Add in some onion and cook for three to five minutes before adding apricot preserves. Keep cooking until it mixes and melts together. Unroll your dough into a rectangle and seal all the edges. 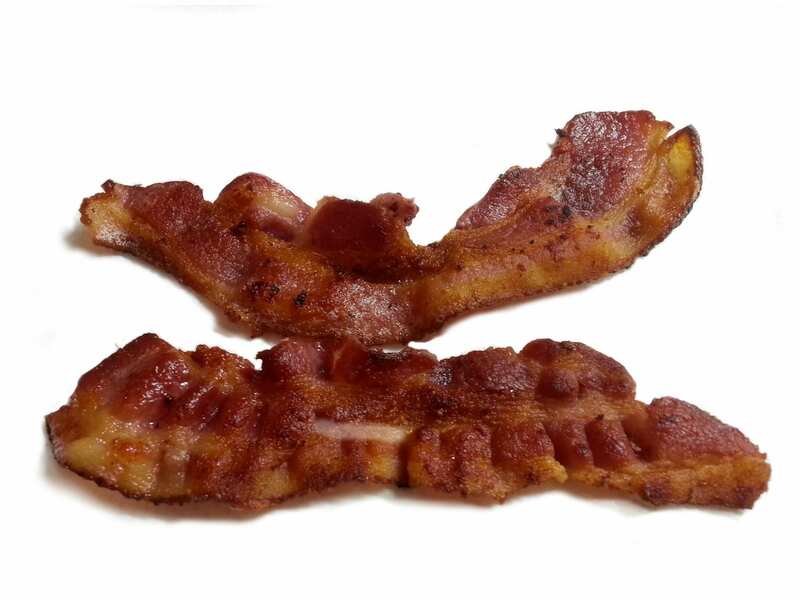 Cut it crosswise into 15 one-inch strips, laying a strip of bacon on each one. Roll each one up and pinch them shut, setting them on a baking sheet seam cut side down. Next, spoon your apricot mix over each spiral and bake everything for 12 to 15 minutes. Get the full recipe here. Last but not least, this breakfast pizza is another delicious way to use crescent dough at home. Preheat your oven to 350 and cook up sausage and onion in a skillet for five to seven minutes. Stir in salsa and seasoning, mixing everything up before taking it off the heat. Next, unroll two tubes of crescent dough and press them into a baking pan (on the bottom and up the sides). Top it all off with your sausage mix and shredded cheddar cheese. Meanwhile, whisk together eggs, parmesan, milk, salt and pepper before pouring that over everything else as well. Bake the whole thing on a lower rack in the oven for 23 to 28 minutes and dig in! Get the full recipe here. As you can see, there’s virtually no limit to the delicious recipes you can make using a little creativity and some crescent roll dough. Whether it’s something savory or it’s something sweet, chances are this list has plenty of recipes that you and your family will love. Have you given any of these a try for yourself? Which ones are your favorites? Let us know by leaving a comment and as always, happy cooking!